Windows 10 allows its users to change the font size according to your preference. For some of you, default font size may be smaller or difficult to read, so you might want to adjust the text size, icon, and font size accordingly to your readability. In this TechPosts, I will show you a simple way, using which you can easily adjust the font size in your Windows 10 computer. 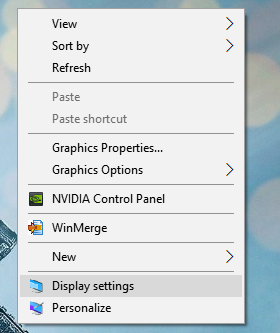 Step 1: Press Windows logo key from the keyboard and search display settings, and open the change display settings. OR go to your desktop, right-click anywhere and open “Display settings” from here. Step 2: Now, under the Scale and Layout, adjust your font change and see what fits your need. If you change the default 100% (Recommended) to 125%. This will increase the size of text, apps, and other items also. Step 3: You can also use Custom scaling option if you want to set a custom font size . You can select a range between 100-500 and then click Apply. Step 4: Once you have set the new font settings, click on the sign-out link to log out of your Windows account. This is necessary if you want new font settings to work effectively with all apps. Step 5: Now all your font and text size will appear bigger than the default font setting. You need to sign in back to your Windows account, in order to do so, press the windows logo key and open manage your account and login to your Microsoft account to save these settings permanently. In case you want to revert back to the default original settings, set the display settings back to 100% (Recommended) and follow the sign out and sign in process again to restore back to default Font settings in Windows 10. Use Windows logo key and ‘+’ sign from the keyboard to magnify/zoom the screen and ‘-‘ sign to zoom out the screen. Exit the magnifier by pressing Windows key + Esc to exit the magnifier. I think 125% works well most of the time. It is not recommended to change the default setting to more than 125%. If you have any query about changing the font size in Windows 10, let me know in the comment section below.